Our travels together have taken us around the world a couple of times including cities on the West Coast of the United States but never to New York. Down through the years, all of our family and friends kept asking us “Have you not been to New York yet?!”. We seemed to be the only ones who hadn’t and we always wondered when it would be our turn to visit New York for the first time. Well, we finally did it! Folks, we have to be honest here. It was so disap...haha! Obviously, am joking, we had an unbelievably brilliant time. Our expectations were built up for so many years watching American T.V. shows and movies, they were as high as the Empire State. Yet still, New York blew our minds! It was a trip we never even dreamed of. New York was always on a bucket list but kind of beyond reach, given our not-so-flush travel budget. Our dreams came true in the form of a photography competition hosted by Trover. Neil entered his beautiful drone shot of Lough Hyne, in County Cork, Ireland and won. The prize was $1500 in travel vouchers for Expedia and, oh my, did we make the best use of them! 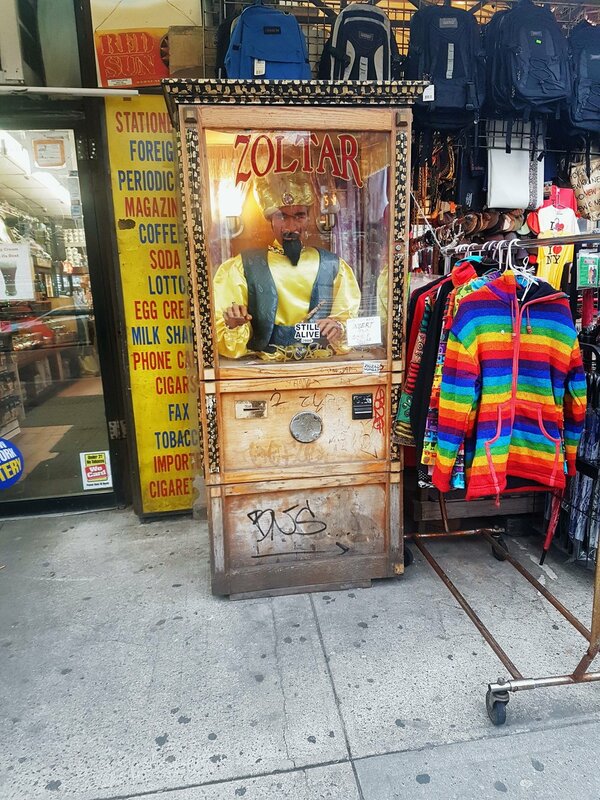 Here’s Neil’s winning photo that helped us to visit New York for the first time and our excited faces on the first night. Note: This post contains affiliate links. By using affiliate links, we earn a small commission when you click through / book a room or tour / buy a product, etc. Don't worry - you don't pay any extra. It's one of the ways we might make a small sum from running this website, and keep the proverbial lights on! Nothing we read or were told could have prepared us for the actual experience of visiting New York for the first time. If you’re from a small city that has yet to build a skyscraper, like Dublin, your eyes, brain, heart and soul will struggle to get used to the absolutely overwhelming size of everything! We’d hung around the Petronas towers in Kuala Lumpur, the space needle in Seattle and we’d lived in Vancouver and Sydney so we were no strangers to living among the behemoths of a metropolis but New York is simply unlike anything we’d ever seen. It must be because there’s so much compacted onto the island of Manhattan, that it seems like every single bit of space is filled to the sky with stone and glass. Getting from JFK airport into the city was during rush hour traffic and it took well over an hour but our first impression of the city was a sight we will never forget. Cresting a hill on the Queens Midtown Expressway, the Manhattan skyline rose up against the night sky before us, sparkling as if replacing the absent stars with the cables of New York’s beautiful bridges draped like pretty little string lights across the East River. It seemed like we were driving into a photo but the top of the Chrysler building and the Empire State grew taller, as if to say, “yes, you really are in New York”. We simply couldn’t stop saying “Wow”! That feeling of pure and utter excitement stayed with us long after our trip was over. When Neil found out he won the competition, we found ourselves, having been to so many iconic and beautiful destinations around the world, at last, planning a visit to New York for the first time. Our flights with Aer Lingus and accommodation in Pod 51 Hotel in Midtown East were covered by the vouchers and we just had to fill in the rest. To be honest, when we started planning, we began by picking out attractions, photography locations and viewpoints but ended up leaning more towards finding places to fill our bellies with delicious food! We didn’t plan a strict itinerary for ourselves but we made sure we knew when and where we were going to eat and we’re glad we did! A valuable tip we’ve learned about planning a city trip, and we highly recommend it for anyone who plans to visit New York for the first time, is use Google Maps. We downloaded an offline map of New York from Google Maps onto our phones and saved all the well-researched restaurants and cafés as favourites (pink love hearts) and all the sightseeing as ‘want to go’ (green flags). It made it a lot easier to find something at a glance, wherever we found ourselves on one of our many wanderings around the city. Turning on our data in the States would have cost us a fortune so having a live map without having to be connected to the internet was invaluable. The most important lesson we learned, and for anyone who plans to visit New York for the first time is to get a 7-day MetroCard. Even if you’re only there for 2 or 3 days, it will absolutely pay for itself many times over and you’ll get around much quicker. Our city breaks are almost always based on us walking everywhere but we were completely unprepared for the sheer size and scale of Manhattan, let alone the other boroughs of New York (JFK is about 12 times bigger than the suburb we grew up in!). It was a hard-learned lesson. Our first few days were going to be broken up by an overnight trip to Tarrytown and Sleepy Hollow (an hour north of the city), so we thought a 7-day MetroCard would be a waste, given that it has to be used consecutively. Walking all day around Manhattan, we thought, “surely we’ll see it all on foot”. How wrong we were! 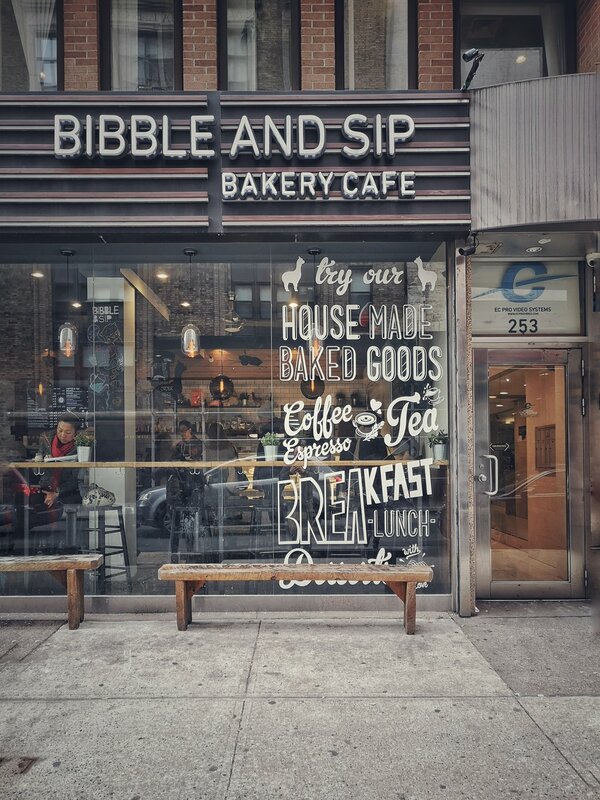 On our first day, our goal was to head over to Bibble & Sip first (for their addictive Earl Grey Tea-infused Banana Bread and creamy flat whites) and then walk generally south towards Chinatown, with some diversions on the way. We got as far as Washington Square Park and realised we were way too ambitious, considering we also had to walk back to our hotel. New York is huge, it’s loud and it can drain you if you’re not prepared. We were out of the hotel from around 8 am to 11 pm and walked approximately 13 km. We walked the feet off ourselves on our first day but it’s not something we can really complain about. Just rambling and zig-zagging our way south, allowed us to absorb the sound of the city, picking out the unmistakable New Yorker dialect from passers by and the multitude of migrant languages, amid the legendary hectic cacophony of New York traffic and wailing sirens. Even though we were exhausted and jet lagged, the city had us enraptured and we just couldn’t stop wandering. With mouths agape at the impossibly tall skyscrapers, the huge trucks honking at bright yellow taxis, fire escapes on red brick buildings, steam rising out of the streets, the pair of us were giddy and giggling (well, Orla was the one giggling) our way down every street, feeling like everywhere we stepped we were in a movie (we even found Zoltar from the movie, ‘Big’). Our feet were worn off us so of course a couple of our rest stops just had to include a seat on a stoop! People at home had warned us about New York-sized food portions but we were still amazed at the amount of meat that deli-counter staff could squeeze between two bits of bread! Katz Deli was recommended by absolutely everyone we knew who’d been to New York but it didn’t appeal to us. Especially because of its popularity, we didn’t fancy the idea of queuing for a long time just to get a sandwich. Instead we stumbled upon random deli counters and they more than satisfied us. In Bistro Market Place on West 24th Street I sampled my first Reuben (Corned Beef, Sauerkraut, Swiss Cheese and Russian Dressing) and I was sold! Neil isn’t a fan of corned beef at all but I grew up eating it for dinner. It was ridiculously big for one sitting so I ended up keeping half for the following day’s lunch. This became a regular money-saving trick throughout our trip and we used our windowsill outside our hotel room to keep food cold overnight. 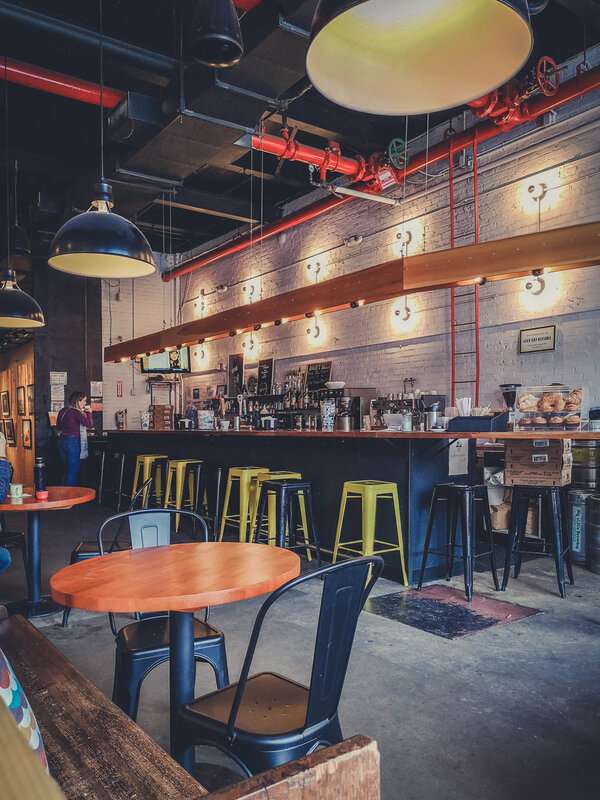 Eating out isn’t cheap in New York but we quickly learned how to save a little bit of money here and there. Near our hotel, 1st and 2nd Avenues had plenty of corner delis to buy the makings of a picnic lunch and it’s also where we discovered our favourite New York slice at Sofia Pizza Shoppe. 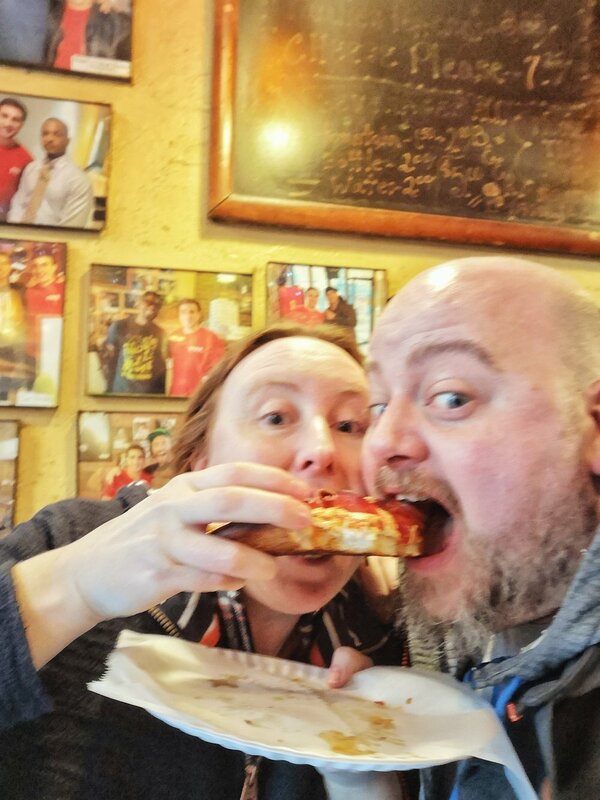 We tried quite a few, even some dollar slices (plenty of these around the city for when you’re really broke) but this was by far the best. Perfectly thin base with crispy crusts and a golden ratio of spicy pepperoni to cheese won the pizza competition hands down. In our humble opinion, it was even better than the famous Prince Street Pizza in Little Italy. In Williamsburgh, we stumbled across Vinnies where Neil fulfilled a childhood dream of ordering from the same pizza place as The Turtles! 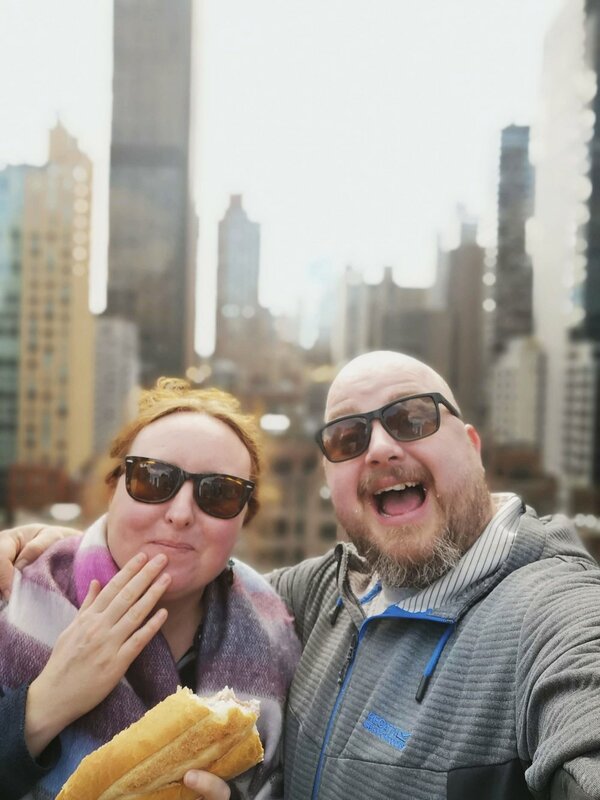 We braved the cold February temperatures and had our picnics up on our amazing hotel rooftop terrace and in Central Park. The picnics saved us a lot of money and the pizza slices were so handy for a quick, cheap evening meal. The breakfast at the hotel unfortunately wasn’t up to much or free but we found excellent value for money at The Mill on East 52nd Street with a huge variety to choose from early in the morning. The pancakes were my favourite and filled me up for the day. We learned quite a lot about how fast New York gobbles up your money within the first few hours of arriving. Although the transfers to and from the JFK were included in the hotel booking, the tolls and tips were a complete surprise. So, folks, if you plan to visit New York for the first time and your transfers are included in your hotel accommodation, you should check if tolls will be extra and don’t forget to tip. We gave our driver 20% as he handled the rush hour traffic with tremendous skill and, being from Queens, he knew plenty of his neighbourhood shortcuts to avoid some of the highway tailbacks. After dropping off our bags in the hotel we went out to stretch our legs ‘around the block’ and ducked into a local bar. We got the cheapest thing on the menu (nachos) and a beer each, tallying up what we thought was within our budget. When we got the bill we understood why everyone complains about taxes! None of the prices you will see on menus will be realistic unless you add 8% tax, so be prepared to pay more than you expect and again, don’t forget to add a tip. A helpful bartender from Galway told us a good guide, is a dollar per drink at the bar and 15% to 20% to your waiter if they bring food. Which leads nicely into the price of drinking in New York. Alcohol prices in Ireland, and especially in Dublin, have become eye-wateringly high so we thought it might be just a little bit cheaper in New York. They are, but only if you find the right places at the right times! 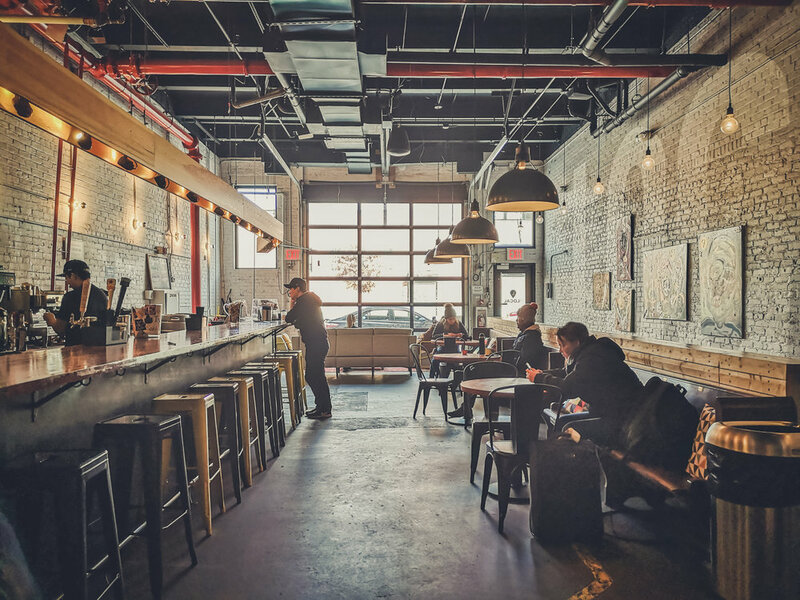 So if you visit New York for the first time and want to go out for a drink, aim in and around the hours of 4pm to 8pm (happy hour) and don’t be afraid to go into the ‘dive bars’. These bars are the kinds of places that are the usual ‘run-of-the-mill’ pub in Ireland, so we felt right at home in these! The cheapest we found was Desmond’s Tavern on Park Avenue which also happened to be an Irish bar. With pints of Pabst Blue Ribbon for $3 during happy hour, it would have been too easy to sit there for the day, enjoying the local banter but we kept sensible heads on us and only had a couple of drinks so we could continue sight seeing. In Williamsburgh, I was delighted to find some decent draft hard cider on tap and it was during happy hour! At Soft Spot, it’s buy one, get one free (they give you handy tokens to use for your second drink), from 4 pm to 8 pm everyday and it’s really cozy with a casual vibe, soft lighting and good music. Needless to say, it was an ideal place to hide from the -6 C temperatures in here for a couple of hours! Their terrace out the back looks like an ideal beer garden for summer nights. Our biggest night out was in Hell’s Kitchen and we had an absolute blast! 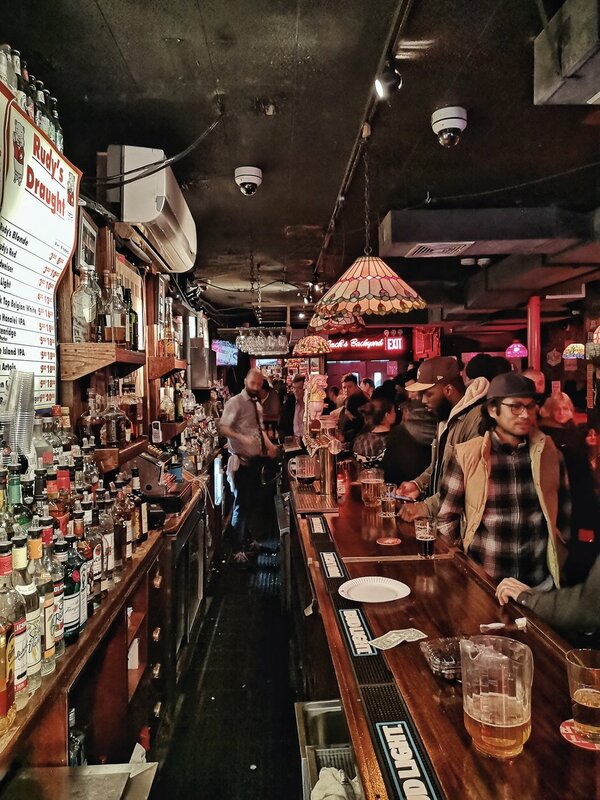 Rudy’s on 9th Avenue is jam packed, even mid-week, full of interesting characters and you get a free hot dog with every beer (Neil asked for four each time and got them!). So we had lots! Pitchers of the cheapest beer were only $8 and if you get yourself a seat in there you will absolutely end up chatting away until the wee hours. Our night ended with us walking through Times Square at 3 am with nobody around. It was a great way to see it! That night out was brilliant fun and memorable because of the people we met. The people of New York don’t deserve their reputation as being rude or unfriendly. Every single New Yorker we spoke to or asked help from was incredibly kind and generous with their time. From shopkeepers, security guards, bartenders and wait staff, to random people on the street, we were given the warmest of welcomes and help with what we needed, whether it was directions or local tips. Maybe because it was off season and there were less tourists around compared to the high season, everyone had a bit more patience and they weren’t struggling under the oppressive heat of a New York summer. I would be rude too if I was sweating buckets and the city streets were impossible to navigate with too many people! It’s another reason to pick your dates during the off season, if you plan to visit New York for the first time. Pod 51 Hotel was our first experience in a pod hotel. 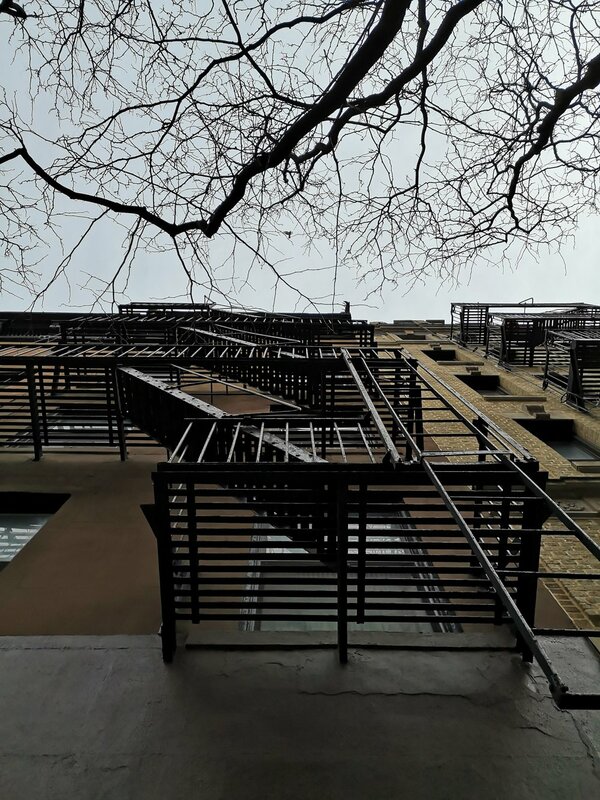 The location was excellent, right around the corner from the Chrysler Building and we felt at home in our little neighbourhood block of East 51st Street and 2nd and 3rd Avenue (we absolutely loved saying the names of streets and of course in our very poor attempts at a New York accent!). A Pod Hotel kind of speaks for itself as the rooms are tiny but we happily settled in and actually enjoyed how well designed it was, with great storage under the bed and a nifty sliding door system for the little shower and toilet area. The most outstanding feature of the room was the view. We were on the 12th Floor, in the middle of skyscrapers in Midtown Manhattan which we could look out at from our bed and from the shower! The two mornings it snowed heavily was like a fairy tale, watching huge snow flakes float past the windows of the skyscrapers at the foot of our bed! The rooftop terrace was the best thing about the hotel, even in Winter. On the clear, sunny days, we were warm enough to hang out for an hour and take pictures. For our last 4 nights in New York we decided to experience staying in one of the boroughs so we headed over to Queens. 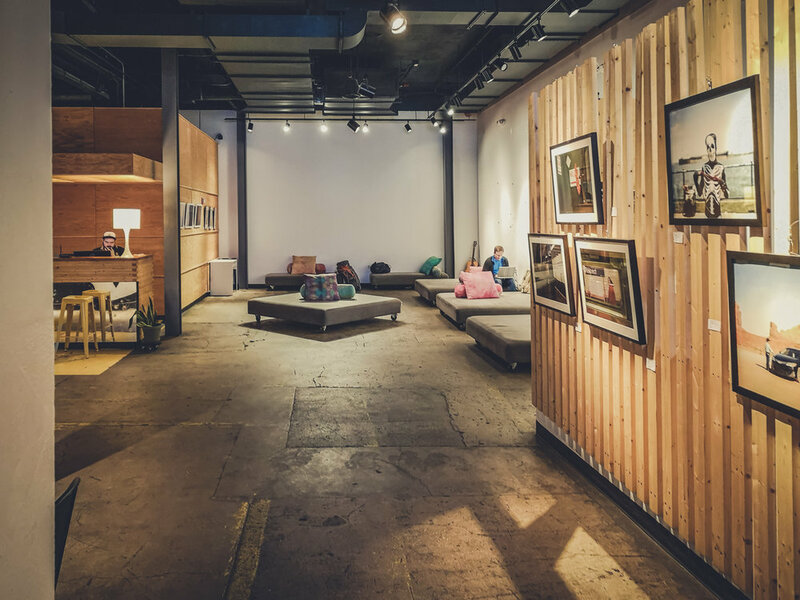 We found The Local NYC and liked the look of its community art space and rooftop terrace. It’s a decision we were delighted we made because it gave us the chance to compare what it’s like to sleep both in the belly of the beast and somewhere off the island of Manhattan. As far as we’re concerned there aren’t any disadvantages to staying outside Manhattan. 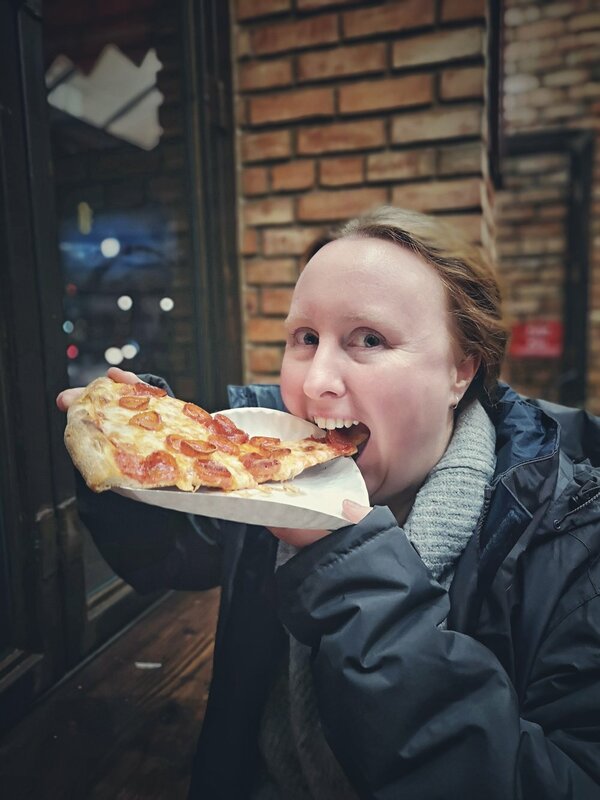 In fact, we found it was a much better experience because the noise levels are significantly reduced and you get to see the Manhattan skyline everyday, which we will never tire of! 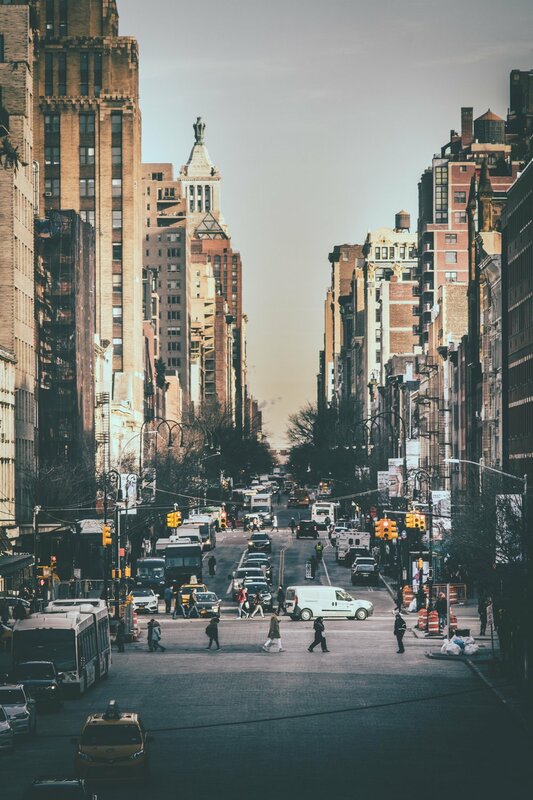 Once you have your 7-day Metrocard, hopping on and off the subway or the bus to get in and out of Manhattan, is quick and convenient so there’s no real advantage to being in the centre of it all. 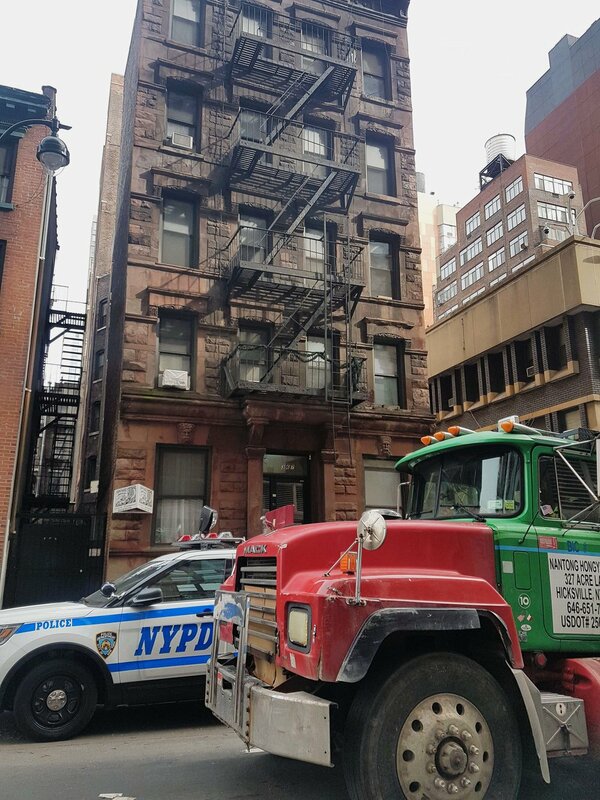 For a private en suite double room, great facilities and given it was only a couple of subway stops over the beautiful Queensboro Bridge from Midtown Manhattan, The Local NYC was great value for money. Having the shared kitchen and supermarkets close by made it even easier for us to save money on eating out at breakfast and lunch. The onsite bar and café meant plenty of opportunity to mingle with locals and tourists alike. We got to know a group of young lads who were working on their apprenticeships down on the Hudson Yards construction sites. They bought us coffees and shared great stories and photos they had from working high above the city. Of course we followed each other on Instagram so we can keep in touch and they might even come to Ireland for a visit some day. 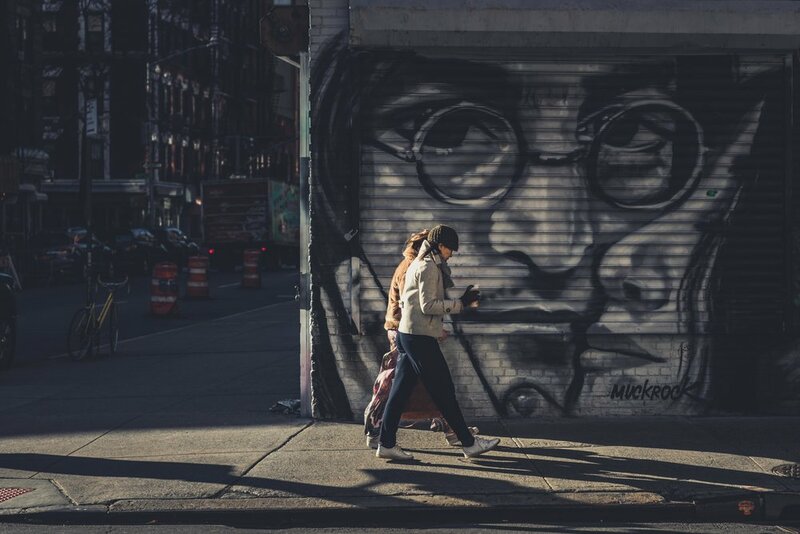 Visiting New York for the first time was an unforgettable experience and we’d love to do it all over again with the lessons we’ve learned from it. There’s so much to this behemoth of a city, there’s just no way we can squeeze it all into one blog post! 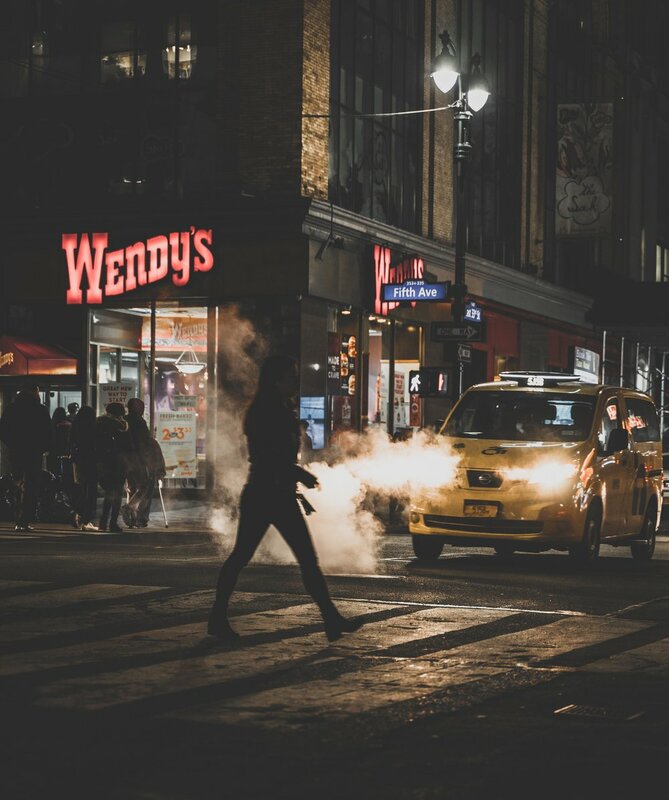 We had plenty of ‘first time’ experiences especially when it came to the food and we can’t even begin to express our delight at New York’s many iconic attractions. In our next blog post we will just have to try!